Sending a luxury food and drink hamper to staff, clients or suppliers whether as a Christmas gift or throughout the year as an appreciation of their work, their order or their relationship with your business, is an extremely positive and rewarding experience. Hamper.com is one of the UK's biggest hamper companies with almost 40 years experience in supplying hampers to business and corporate customers who know the positive effects corporate hampers and corporate gifts have on cementing relationships with your clients, suppliers and to reward and motivate your employees. Trusted by thousands of business customers every year! FREE UK DELIVERY - Delivery to single addresses or in bulk to one address all free to any UK address. LOYALTY POINTS - Collect points on every purchase made online which can be used for future orders. DISCOUNTS - Generous discounts available for large and bulk delivery orders, contact our corporate consultants for more information. CORPORATE BRANDING - Add that personalised touch to your gifts, with a range of branded ribbons and gift cards. CREATE YOUR OWN CORPORATE HAMPER - Choose the food and drink your staff and clients will love. Order your bespoke corporate hamper online or contact our corporate team direct and we can send your personalised hamper in bulk! Contact Our Specialist Corporate Team today! You can place your order on-line for smaller orders this includes sending to multiple addresses in one order or contact our corporate team for larger and bulk orders. Can you help with specific hamper and product requirements? Yes of course, we have a huge range of hampers in the range, but are completely flexible and if you are looking to purchase a quantity of hampers we can create hampers to suit your requirements. Contact the corporate team to help you with this. Yes, if you are happy to have your delivery to one address we can send it in bulk and this means we can make savings on the delivery cost which we are happy to pass on to you. Contact the corporate team now to see how you can save. Can you brand or personalise hampers? We have an array of branding options available on a case by case basis depending on quantity. Most popular options include corporate gift-cards with your choice of corporate message and logo. Branded ribbons and corporate merchandise added to the gifts are options too. Contact the corporate team to find out more. You can create your own account on the website if you wish to order online and pay by credit card or paypal, alternatively for more frequent or volume orders speak to the corporate team if you would like to set up a credit account and to be invoiced. 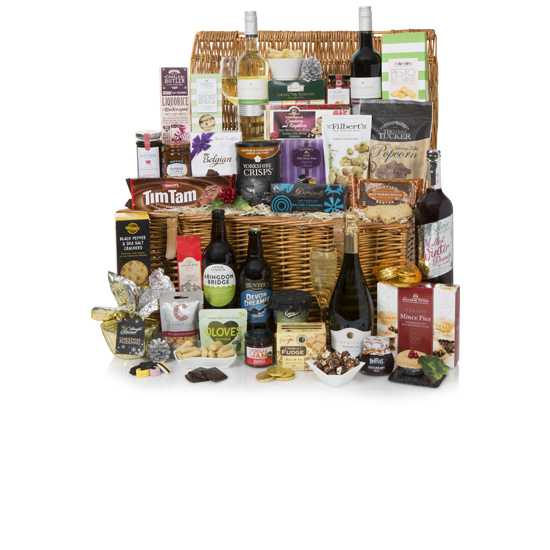 What is the delivery cost to send a hamper in the UK? We offer free delivery in the UK, Northern Ireland and the Highlands & Islands and we also offer discount for bulk delivery. Can we send hampers overseas? Yes of course, we have almost 40 years experience in sending gifts Worldwide, contact the corporate team now for more information. Can you provide hampers and gifts for any occasion? Our corporate gifts range is ideal for all occasions, Christmas, birthdays, retirement, reward and motivation, thank you’s and lots more. Sending a luxury hamper to clients, staff and suppliers is the perfect gift to make the right impression, whatever the reason. Hamper.com (Clearwater Hampers) understand the complexity in sourcing, supplying and delivering gifts for businesses that not only cater for everyone's taste, dietary or religious requirements, that are delivered promptly at a time that suits you business and the quality an price is as you expect & agreed. The Corporate Team at Hamper.com are part of the Clearwater Hamper family who have developed business gift solutions with some of the UK’s biggest companies since 1979 and can do the same for your business. This relationship is built on trust, understanding and competency. Your reputation and business is too important to risk with just the cheapest price, from tried and tested products, Hamper.com have built up our reputation for delivering when and where it matters, with high quality gifts and a premium service standard that clearly sets us apart from other hamper companies. Ordering large quantities of hampers and gifts for employees or important clients can be very stressful as it is an emotional and personal process. With our experience and knowledge in corporate gifting, we can give you the comfort that you need by taking care of every detail and account manage your order from start to finish. Corporate hampers are available at Christmas and all-year-round, so make great gifts for many events and occasions, including client or employee birthdays, employee retirement, staff motivation and rewards, get well soon gifts and thank you presents, plus much more. Clearwater Hampers have been supplying us with high quality hampers for many years. Their friendly staff have always provided us with a fast, efficient service with the flexibility to choose from their large range of pre-selected hampers or the creation of bespoke hampers, all of which are extremely well received by our customers. We have used Clearwater Hampers on a number of occasions to supply Christmas Hampers to our clients and staff. We have always found Clearwater to be good to deal with and accommodating in terms of quality, packaging and the contents has always gone down well too. I would have no hesitation in recommending Clearwater. So get in contact with our corporate team now and we'll send an impressive corporate hamper on your behalf to say ’Thank You’ to your key staff, employees, clients and suppliers. 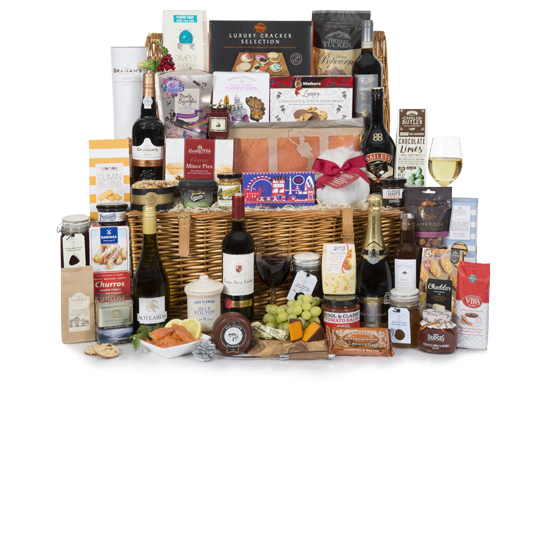 Hamper.com is the UK’s premier supplier of corporate hampers, staff hampers and client gifts. 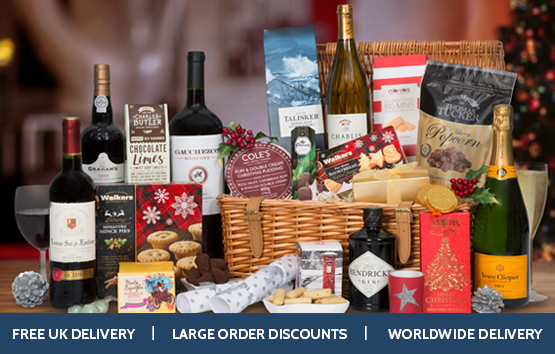 We have been supplying corporates & businesses across the UK and Worldwide with the finest luxury hampers for 40 years, so join thousands of other large, SME and small businesses who have chosen hamper.com for their gifting requirements at Christmas and all year round to show then how much you value your clients business or to reward employees for their work and contribution.